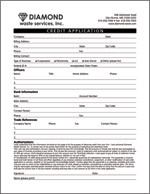 To apply for a Diamond Waste dumpster rental business account, please click the link below to print out and fax our PDF account application to: 410-350-7003. Diamond Waste accepts Visa, Mastercard, American Express and Discover for payment of roll-off dumpster rental, waste removal and recycling services. 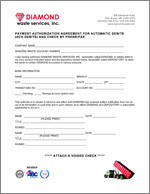 To take advantage of this service please click the link below to print out our PDF payment authorization form and fax to: 410-350-7003. Reduce mail and paper cluttering-up your desk and help the environment by reducing paper consumption. 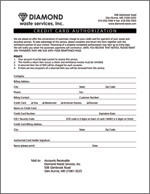 If you would like to receive your Diamond Waste invoices via e-mail, please contact Diane Law at 410-350-7000 or DianeL@diamond-waste.com. 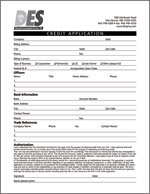 To apply for a Diamond Environmental Services portable toilet rental business account, please click the link below to print out and fax our PDF account application to: 443-749-1010.